You really got my attention with this one. You used REGULAR CCC paint - not a special fabric paint...right? This is petty amazing. I have an old wing-back chair that needs this! Yep! Just regular CCC Paint. Nothing more. The secret...is finishing it in the Satin Finish! Glad to inspire. Happy Painting and thanks for stopping by! Thanks so much for stopping by. AND thanks for sharing with your friend. I emailed you with the info on subscribing and following. Thx again for your kind words. I love how this turned out!!! I have been wanting to try this paint for awhile now, now I jus need to find a chair to do it with! 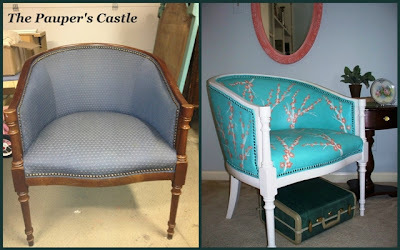 I never would have thought to paint the fabric on a chair with chalk paint - or any paint, for that matter! Love the colours that you used, and your hand-painted cherry blossoms are so pretty :-) Does the paint on the fabric really hold up to the wear and tear of people sitting on it? Surprisingly enough the fabric is not hard like one would think. It is stiff, but stiff like leather seats. So it's still pliable. It's been coated in Satin Finish which is a durable washable sealer. If you spill on it, it beaded up and wipes off. So yep! Just think of it as a new "pleather" chair. :-) Thanks for stopping by and your kind comments. It's simply stunning and I'm so glad you didn't distress it! Thanks so much Connie! I agree...distressing would not have done it justice. There is a time and a place for that! Thanks for stopping in! I'm looking at this - but I can't believe it!!! I just can't believe that this is painted - it's gorgeous! Will it last after being used do you think? Thanks for stopping by and thanks for your kind comments. 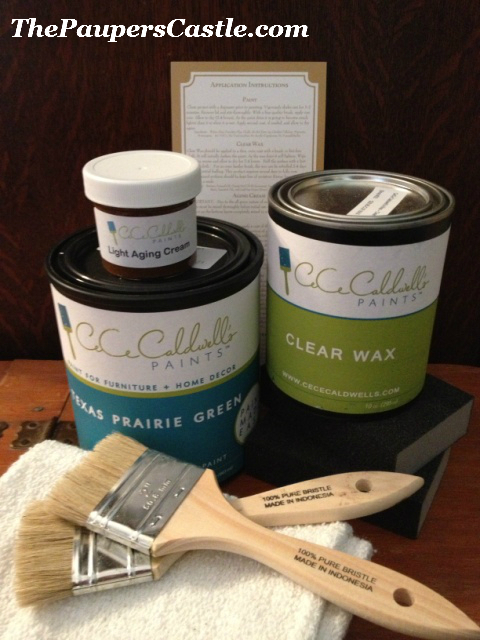 It's been sealed with Satin finish (a CeCe Caldwell's sealer). It's a durable, washable surface. It's very pliable so it should hold up just fine. I did another chair like this (there was a link in the post) and it held up fine too! Nice option if you dont' want to take the time to reupholster. Now...would I do this on an expensive heirloom chair...no! But great for trends and goodwill finds! Off to check you out! Wow! What an awesome job you have done. You are so creative! I learnt about your Blog from the Talkin' About Thursday Link Party. Congratulations on being featured. I am a new Follower of your Blog. If possible you can link up on the Creative Monday Blog Hop that I host every week. Take care and enjoy the rest of your week. Thanks for stopping by and thanks for the follow! What a surprise for DeDe to feature my post. I am honored. Will check out Creative Monday Blog Hop for sure! Thanks for sharing with me! Off to check out your blog! Have a great week! That is absolutely GORGEOUS! Great job! I found you featured over at DeDe's blog. I am following now. I would love you to come join my Pin Me Linky Party that starts Friday morning at 8am CST. I allow up to 3 links each week! Thanks for stopping by and thank you for your kind comments. I will head over shortly and check all this out! Thanks for the follow too! Thanks for linking this up. I hope you come again! Never in a million years would I have thought to paint fabric! Amazing...it is beautiful! What a fun pop of color! I've painted a throw pillow before and loved the outcome. Your chair makeover is amazing! This is amazing! I would have NEVER EVER tried chalk paint on furniture. I did try spray paint once and it failed miserably....I'll have to keep this one in back of my mind. Thanks so much! I tried painting once with Latex and failed with that too! It was scratchy. This is not at all. You should try it sometime. I think you would be very surprise how it comes out! I've seen painted "reupholstery" jobs, but not with the terrific stenciling - makes it look like a printed fabric with so much more personality. Well done! Thanks for stopping by! This one, I actually painted by hand. The blue and brown one I stenciled. Glad to know it looks like fabric...that's what I was hoping for. Over from Redoux's party. This is absolutely gorgeous!! I would never think to paint a chair! Yours turned out amazing! I love the colors you used! Thanks so much for sharing! Have a wonderful weekend! Thanks! I loved the colors too. Now I just home it finds a home that will love the colors too. Unfortunately for me, it matches nothing I own. :-( Have a wonderful weekend too. Wow! Love the color combo! I would have thought it would have to be fabric paint. Is the fabric stiff because of the paint? I love the look of your free-hand design too! That is just AMAZING! I can't believe you PAINTED that gorgeous chair! I am hopping over to that giveaway right now! Thanks for your kind comments and thanks for stopping by! Thanks you so much! Will need to come check out your blog! This looks great!!! Found you at Miss Mustard Seed, and from the thumbnail I just had to see this chair. Love the colors and the pattern you painted looks awesome. There's a party at my place if you feel like stopping by! Thanks for taking the time to look closer. Thanks for your kind comments. Things can sometimes get lost over at the "Seed". It's a big party! Will come by to see you. :-) Thanks for sharing. Paint!?! That's crazy! I never would have thought of that! I totally would have been the one pulling out the brads and staples. It looks beautiful!! Great job! Thanks so much! Been there, done that, still doing that! I have a chair that has been in my garage for over a year. I stopped counting tacks once I reached 300 and I still have 1/4 of the chair to do. This is a FANTASTIC alternative. Thanks for stopping by! Great idea! Thanks for sharing this at Rustic Restorations Weekend! That is fantastic!! All those chairs that I have walked past . . . I cannot wait to get to goodwill and give that a try for myself. Thank you so much for sharing! Now your eyes will be wide open! If your luck runs anything like mine, there won't be a chair in sight for months. Here's to successful hunting! :-) Thanks for stopping by! Thanks for stopping by! Thanks for the share. I missed the last one, but maybe I will catch you this week! You are super creative. What a great idea. I thought it was new fabric at first. I would love for you to link this up to my Winter Blues Wednesday party going on right now. Hope to see you there. Thanks so much for your kind words! Thanks for stopping by too! I missed last week, but will try to catch you this week. Wow. I clicked over so I could find out where you purchased that wonderful, fun fabric, only to discover you painted it yourself. Well done. Thanks so much for stopping by and your nice comments. To me, this is success. I was hoping it looked like fabric. I think the transformation is amazing. How is it to sit in?? Nancy! Thanks for stopping by. I would say yes...It would probably work better if the constructions are in good shape. As far as sitting and texture...It has the stiffness of leather, but not scratchy. And it's water resistant and stain resistant. As long as you don't mind sitting on "pleather" I think you would be very satisfied. Thanks again for stopping by. Will be over for a visit! You're kidding!! This transformation is amazing!! Rachel, Thanks so much! It was a lot of fun! All I can say is "BEAUTIFUL!!!". Will keep this in mind for future reference. Thank you for sharing.